When the Republic of Azerbaijan became independent, it immediately switched alphabets - from Cyrillic to Latin [December 1991]. Since then, the country has been dealing with the complex and thorny issue of how best to educate and publish in this new script. In Iran, Azeri is still written in the Arabic script (which they often refer to as the "Persian script"), just as it had been in the Republic up until the early 20th century. However, many Azerbaijani Iranians, especially university students, as well as the Diaspora abroad, are expressing a preference for using the Latin alphabet to write Azeri. As many of them do not have a long tradition of reading the Azeri language at all, the question arises whether they might just switch to the Latin script as Azerbaijanis in the North have. Is it possible for North and South to meet in a common script? Here Reza Fathollahzadeh, an Azerbaijani from Iran who now lives in Australia, argues that the Azeri Latin alphabet currently used by the Azerbaijan Republic is the best option for all Azerbaijanis. If converting to a Latin script is inevitable for the purposes of e-mail and the Internet, he says, why not use it as the working standard, rather than scrambling to come up with a new, slightly different Latin alphabet? 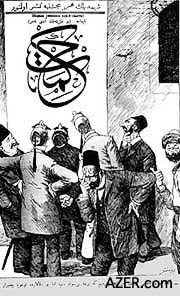 Left: The use of Arabic script for Azeri resulted in high illiteracy, according to writers of the Molla Nasraddin Journal (early 20th century). Here the artist satirizes the situation. The real problem with an Arabic-based alphabet for Azeri is that it doesn't fit the soul of the Azeri language. Over the years, our intellectuals and writers have complained that several sounds in our alphabet are not expressed in this script. In fact, there's a humorous anecdote about it. Once Molla Nasraddin, the comic sage, wrote a letter using the Arabic script. The person receiving the letter went in search of someone who could read it who, in turn, went looking for someone else until the letter finally made its way back full circle to the Molla himself, who discovered that he couldn't even read what he had written in the first place. Among Azerbaijani Iranians, there are currently two different movements related to the Azeri language: one is toward a Latin-based alphabet, and the other is toward a Farsi [Persian]-based alphabet. Note that I refer to the script used in Iran as "Farsi-based" rather than "Arabic-based" because the modified Arabic-based Azeri alphabet in Iran contains four additional letters (p, zh, g, ch) that don't exist in the Arabic script. The Farsi alphabet contains 32 letters, while the Arabic alphabet contains only 28 letters. I think everyone now agrees that Azeri needs 32 letters (nine vowels and 23 consonants) plus an apostrophe ('). When I was in Iran, I found six different Azeri alphabets have been designed on the basis of this principle. My interest in the Azeri alphabet began when I was a teenager. Someone told me that Azeri was not a living language because it didn't have its own alphabet. I was very upset at the time and argued that this was not true. Even 20 years ago, I already had taught myself to read Azeri in the Cyrillic alphabet and was very familiar with Azeri in the Arabic-based alphabet. (I had read the version of "Koroghlu" that was edited by Hemmat Alizadeh and published in Baku around 1905.) Even at that time before the Soviet Union collapsed, I knew that Azeri had been written in the Latin alphabet in the 1920s and 1930s. I had assumed that the people in the Azerbaijan Republic liked Cyrillic. So when I learned that they were changing to Latin, I felt a bit sad because each change to the alphabet brings about damage to the written language. But later, when I found out that Stalin had imposed Cyrillic, I could understand why they switched to Latin the first chance they had. In fact, I think it should be a human right that people love the alphabet of their language. I believe that the Azeri alphabet is the most fundamental issue related to our national identity. If we all used the same alphabet, then all of our literature could be converted to that one script. Our children would all be able to read works by Nizami, Fuzuli, Vahid, Shahriyar and other famous Azerbaijani writers. When making this hypothetical decision to have a unified script, let's not forget that most of the world's Azerbaijanis live in Iran. Many people estimate between 25 to 30 million Azerbaijanis live in Iran, whereas the population of the Azerbaijan Republic is less than 8 million. So if we are all to use the same alphabet, it must be acceptable to Azerbaijanis in both north and south. If we were to switch to a Latin-based alphabet, there's already a popular Latin script that we can use for Azeri-the one that's being used in the Republic of Azerbaijan. There's no need to "reinvent the wheel" and create another version of the Latin alphabet. The Republic's alphabet is perfectly adequate. In Iran, there are such movements to create another, different version of the Latin alphabet, but I think this would be unnecessary and absolutely harmful to Azerbaijani unity. The Republic's Azeri Latin script, which I call the "Azerbaijan Modern Alphabet," is admittedly still in transition. But I believe it has the potential to work in both North and South Azerbaijan. Recently, I gave a paper about the Azeri language outlining three main points. First, we need a National Endeavor. Second, we need to convert our important literature to the new script and republish these works in the modern alphabet and make some of them available on the Internet. We shouldn't let our national heritage vanish just because of outdated alphabets. Third, we should propagate our modern alphabet among Azerbaijanis all around the world. In fact, my paper was titled, "Let's Proudly Spread Our Alphabet." My main point was that we should be proud of our alphabet and work to make it more widespread. Personally, I love the Arabic script and enjoy reading the holy Quran. But for Azeri, Arabic is absolutely a mistake. Azerbaijani intellectuals have had to deal with the shortcomings of the Arabic alphabet for centuries. I hope we can use Latin to carry the soul of our language and culture forever. Reza Fathollahzadeh is a Doctoral Student of the Faculty of Energy Planning and Policy Program at Sydney's University of Technology. Contact him at: rezafa@eng.uts.edu.au.